King's Memorial Takes Shape Near His 'Dream' Spot On the Tidal Basin in Washington, D.C., a monument to Dr. Martin Luther King Jr. is being carved. Gigantic granite cliffs form the entryway, like massive stone curtains about to reveal a permanent reminder of the man who articulated a dream for so many Americans. 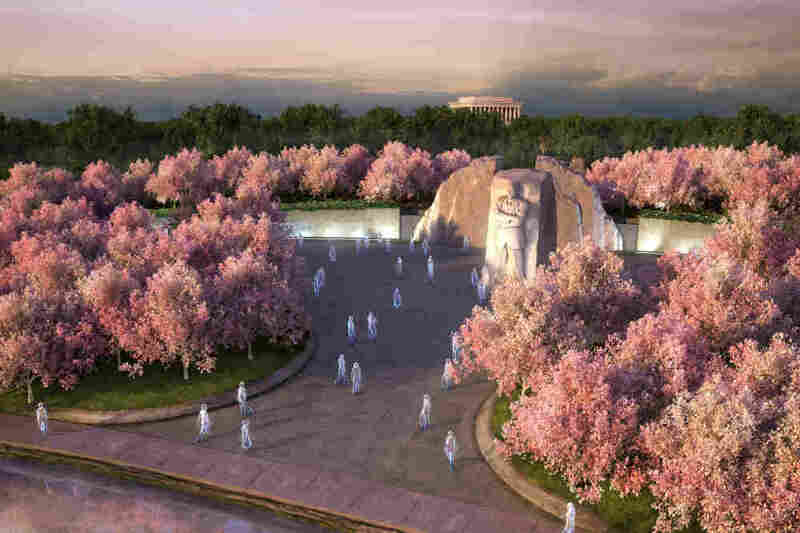 An artist's rendering of the Martin Luther King, Jr. Memorial on Washington, D.C.'s Tidal Basin. The Lincoln Memorial, where King gave his I Have A Dream speech in 1963, is in the background. Aug. 28 marks the 48th anniversary of Dr. Martin Luther King Jr.'s I Have A Dream speech, delivered in 1963 from the Lincoln Memorial in Washington, D.C. On that date this year, a memorial will be dedicated to the great civil rights leader. The new monument is being created on Washington's Tidal Basin, in view of the Lincoln Memorial and almost directly across from the Jefferson Memorial. Gigantic cliffs of granite form the entryway to the memorial. Carved with chunky lines, they're like the massive stone curtains of a theater, signalling that something important is about to happen. Behind the granite blocks, you can see the waters of the Tidal Basin, sparkling gently in the sun. Some of Dr. King's most memorable words are being carved into the walls of his memorial, which sits on a four-acre site. Nick Benson is the chief carver. His other projects include the National World War II Memorial and carvings at the U.S. Capitol. Benson designed the clean, modern font being carved into the granite. He used a rubber stencil to trace the 3 ¾-inch-tall letters onto the wall and is now incising them into the stone with a pneumatic hammer. "Very, very, very rarely is it hand-cut," Benson says. "The pneumatic hammer is just a piston hitting the chisel, so it's a much more rapid process. The skill that it takes to do the work we do is no different with a pneumatic hammer than with a hammer and chisel." Benson is a third-generation stone carver. His grandfather did the inscriptions for the Iwo Jima memorial near Washington, and his father did both the FDR memorial and the Kennedy Center. Benson did a good deal of research before starting work on the King monument. He watched newsreel and TV clips of King, noting how the practitioner of nonviolence moved, and listened to his great oratory. In one clip, an interviewer was trying to get a rise out of King, prodding him about Malcolm X's messages on black power. "Not only did he not buy into it, but he was able to ratchet the whole conversation down," Benson recalls. "He turned it into an intellectual discussion, and he just completely decimated this guy." That clip showed Benson the power of nonviolent confrontation. Benson was born in 1964, a year after the famous I Have a Dream speech. Growing up in Rhode Island, he didn't know much about nonviolence, King or the civil rights movement. "My parents were getting divorced," he says. "I was a kid in turmoil, so I didn't have a lot of time around the TV." King's own children were involved in creating this memorial. Sculptor Lei Yixin first made four small models of the statue, each with a different facial expression. Photographs of all four were shown to King's children. "Which one looks most like the father you knew?" they were asked. "They chose the very first creation that Lei had produced," says Ed Jackson, executive architect for the King memorial. He was responsible for every aspect of the project — choices about the sculptor, the kinds of trees that embrace the site, the stone for the walls and for the sculpture. That last decision is a bit peculiar. The noble black man, flag-bearer for his race, rises against the horizon in what they call "shrimp pink" granite. "I was after a granite that could withstand the test of time and the elements," Jackson says, "And to select a granite piece that depicted an African-American as opposed to a grey, or a white, or a solid black — which would be problematic at night to light it up." A memorial for all seasons, Jackson has watched weather settle along this newest addition to the banks of the Tidal Basin. Snow froze the water, and made the walls and statue look snow-capped. And the famous Washington, D.C., spring added special meaning. "I think that for us, the essence of the cherry trees blooming each spring is an affirmation his dream hasn't died," Jackson says. "That it is reborn every spring." Thomas Jefferson and Abraham Lincoln have inhabited their memorials for decades. The architects and sculptors and masons and landscapers who created this newest monument know what weather and time can do. Carver Nick Benson is philosophical. "You know Percy Shelley's poem, Ozymandias? 'Look on my work, ye mighty, and despair.' Nothing will last. Nothing is eternal, so all of manmade objects will disintegrate away," Benson says. "But this'll stay here for a while."